That's awesome! Let's see some pics. but these will take some time. Can't wait tho! But then again my plans probably will change. Guaranteed some sort of cab down the road. Seriously though, I'm envious. I live in a small townhouse, so no gameroom yet. I aspire to be like you guys. My plans for the future are a mame cab and a Chexx bubble hockey. "Do you believe in Miracles?" I'd like to see some pics of your stocked gamerooms also. gozur i think you have the best machine of them all, of course i am talking about the snow cone machine. where did you get it? i would be the happiest man on earth if i could have a snow cone anytime i wanted. as far as pictures go i had to move all the games out to the garage. i am going to start drywalling the garage and turning it into my gameroom. i will post some pictures of the progress as soon as it starts. i think my gameroom will be the only one with a '53 ford custom in it. i little consection but i do love my car as much as my games,maybe even more, so they will each have half the garage. 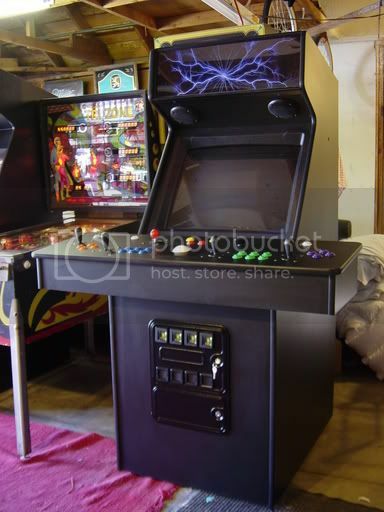 My MAME cab is in the living room, since I'm not gonna carry that heavy beast upstairs. Lots n lots n lots of boxes of stuff! Smart & Final / Cash & Carry sells them. I'm pretty sure I saw one in SoCal last time I was down that direction. From what I understand, not all of their retail location stocks them, but they can all order them. My location in SJ stocked it, so I didnt have to pay frieght which is good, because the grinder is industrial and weighs in at about 40lbs. I have some outdated pictures, and like Dirt am doing some dry wall work in the game room. Last month I built and attic for storing holiday crap for the wife and now I am building a hidden shelf / closet area. I can probably snap more current pix in the next 2 - 3 weeks. Sadly enough, no mame machines yet, but planning on 2 very soon. Ah, I am stifled by a small townhouse. But I have my Mame arcade cab and an original Double Dragon cab. Hope to someday have a house...with a very large garage...err, game room. well i have two new addictions to the collection. first and formost i am now the very proud owner of a sno cone machine and i picked up a dart machine today. the monitor is no good but everything else seems to be working. MAME cab, Playable, but not finished. HO Slot Car Track 4 lanes, 56 foot lap length. Refridgerator, microwave, gas range with oven, a full bathroom. I could pretty much live down there! IANAL: I am not a llama! a LOT of computers and consoles, ping-pong table, pool table, piano, and sadly underused excercise equipment. I ran out of room six games ago. But I can't stop buying. well i just picked up another machine today. a whack-a-mole for my kids. i deceided to rearange the garage tomorrow and hold off on the drywalling for awhile. so i might have some pic's up tomorrow night or the following day. My game room is tiny... it was meant to be a formal dining room, so it's only something like 10x12. It contains my MAME cabinet, a 3-in-1 game table (foosball, pool, air hockey), a basketball game that folds back up into a cabinet in the wall and a dartboard. - I would love to add a Slurpee machine......! Holy crap are you guys ever lucky! I must say though, I have the best of all. I have a TV, a PS2, a computer, did I mention I have a TV I got foosball and ping-pong tables, but nothing special like you people! This is insane! Where's the picture of your sister? Ummmm....Dannny...every pic I've seen on one of your posts is of the 'purple room' with the red stools. Also, is that chain link fencing on your windows? Is there something you need to tell us? Are you in an Aussie Max Security lockdown? Aussiecatraz? Ummmm....Dannny...every pic I've seen on one of your posts is of the 'purple room' with the red stools. i just picked up a pinball to add to the collection. it is a williams tri zone from 1979. And room for tons more!